How can I put subheads or dividers in my paypal checkout section? I'm not sure if I understand your query correctly. Are you referring to adding additional options to the payment field? If so, please refer to the guide that can help you with this. If you are referring to something different, we request you to provide us with more information of your requirement so that we guide you in the right direction. HOPE FIELD / JUNIPER PARK <<<June 27 – July 1 – Hope Field / Juniper Park, 9am-3pm (payment in full) - $350. Please see the screencast below that can help you with setting up with this options. If you need to have more options, it is required to have the options setup using native checkboxes/Radio buttons/dropdowns from the form builder and have the conditions setup to show/hide the fields as necessary and to calculate the total by using the assigned values to the fields. The calculated total can be forwarded to the payment field as well. That’s nice. However, it does not solve of problem because the dropdown takes up the same height (or more) than the two choices I currently have. 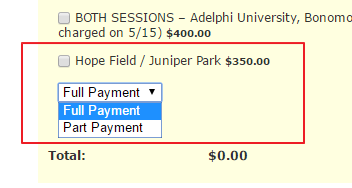 What I need is a way to ADD BOLD HEADLINES or dividers to the Hope Field / Juniper Park choices from the Adelphi University choices. Alternatively, how can I make a word in a description of a purchasable item show in bold? Do you mean to have part of the headings in bold as shown below? Please be noted that some HTML tags can be used within in the description. You may use HTML bold tags <b></b> to display the content in bold letters. In the above example, the content THREE WEEKS will be displayed in bold in the payment field. Hope this information helps! That might well satisfy this need. Thanks! Glad to see that the solution provided works for you. Please do not hesitate to get in touch with us if you need any further assistance. We will be happy to help.